Students in the MEng NAME program require a minimum of 30 credits of coursework, which includes a 3-credit capstone design project and a 2-credit internship. Although the program has a large core with limited flexibility, up to 6 credits may be approved for core course equivalents taken prior to admission, allowing for streamlined entry and limited room for constrained electives (must be approved by Program Director). Students will automatically be registered in a standard timetable in August, and will be contacted with the course schedule at that time. Students who have taken core course equivalents prior to admission should contact name@apsc.ubc.ca to request approval for chosen electives and a customized timetable. Marine propulsion systems; ship engines; shafting; ship vibrations; on-board systems (piping, HVAC, electrical); advanced propulsion systems. 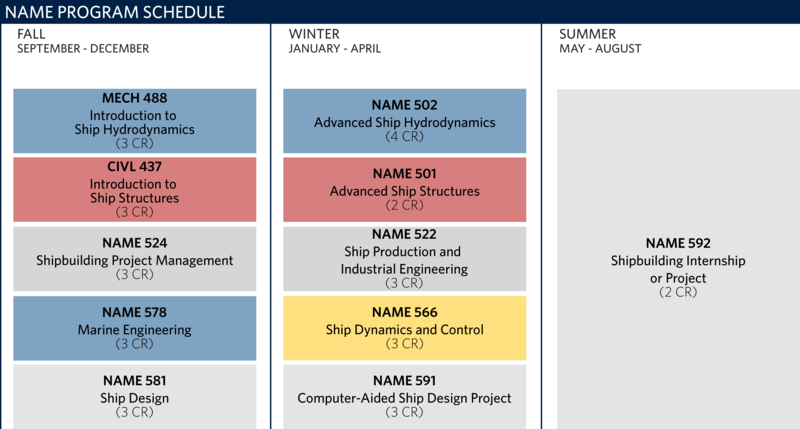 This course introduces the ship design process from a Systems Engineering point of view. Students learn how to translate Owner’s Requirements into optimal ship characteristics. Corequisite: All of NAME 578, MECH 488, CIVL 437 and one of NAME 524, APPP 501. Pressure hull design; finite element analysis applications; classification rules; ice and ice loads; dynamic loads including slamming, risk and reliability. A capstone design project designed to give students experience in the preliminary design of a special purpose ship. Students work individually and in teams, using advanced design software and databases, to design a vessel according to specified criteria. Prerequisite: All of NAME 581, NAME 578. Corequisite: All of NAME 502, NAME 522, NAME 501, NAME 566. Students complete a twelve- to sixteen-week internship at a marine-related company or agency. * Duties may include technical analysis, participation on a design and/or production team, and field work. Final report and presentation required. Prerequisite: All of NAME 501, NAME 502, NAME 522, NAME 524, NAME 566, NAME 578, NAME 591. * Note: The Engineering Co-op Office provides coaching and support to students seeking internships and strives to find internship opportunities for all students. The Co-op Program has been very successful thus far; however, hiring decisions are ultimately up to the companies and the department cannot guarantee that all students will be hired. Students are welcome and encouraged to search for intern positions on their own as well.